Can OO Presentation go full-screen to the secondary monitor? I have two screens set up on my desktop, the second is a projector. For obvious reasons I would like to have the secondary screen ( projector) display the full-screen view of OO Presentation. I am using an NVIDIA Graphics card and the NVIDIA X Server settings. 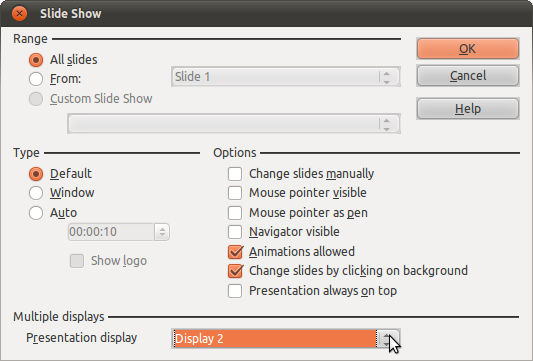 Go to Slide Show -> Slide Show Settings... and select the desired display as your Presentation display. Now if you start your presentation using F5 it will be displayed on the selected display. The same applies for LibreOffice. Not the answer you're looking for? Browse other questions tagged 10.10 nvidia multiple-monitors openoffice.org or ask your own question. Force full-screen game to one monitor? How do I make a Google Presentation appear on the projector display? How can I activate a second monitor displaying a second screen? 14.04 How can I adapt my screen to the lower resolution of a undetected projector (nvidia driver)?